In order to reliably get more customers, you need to answer few very important questions about your business. Maybe you’ve been pushing your stuff on social media, thought about Facebook ads, and even tried writing a few blog posts. If you’ve done all this and still don’t have as much traction as you’d like, it might be time step back and make sure the fundamentals are in place. Don’t beat yourself up too much. There are metric tons of information out there telling you “what you absolutely, completely, totally, must do” to earn a zillion dollars from your website this month. A lot of these articles just barely scratch the surface. My number one rule is to never play keep away. So, I’ll try to do better than that! If you’re just starting out and haven’t started selling yet, then I caught you just in time. These questions will keep you from running into a few dead ends along the way. If you’ve been at it for a while, no worries, it’s not too late. Before trying to learn those “Advanced Facebook Advertising Strategies”, you need some straightforward, dead simple answers to some basic questions about you, your product, and your customers. These questions will help you frame the challenges of finding new customers and retaining your old ones. By the end of this post, you should have a much better understanding of your customers and how to sell to them. Question #1: Who’s already buying from you? I said “basic”, right? It doesn’t get more fundamental than this. If you already have some customers, then this is the place to start. Who is buying your stuff? What do you know about all these people? Do they live in urban areas or are they mostly rural? How old do they tend to be? What are some common interests? What social networks do they use? Tracking down, organizing, and finding patterns in your customer and website visitor data can seem like a challenging task. I won’t deceive you here. It takes time and thoughtfulness to make sense of it all. Here are some places to find the data and some tips about putting it together. If you have a Facebook business page, you can start here. On your business page, access demographic information about your page. This data shows only the distribution of fans on your Facebook page. It doesn’t reflect your website traffic or actual customers. 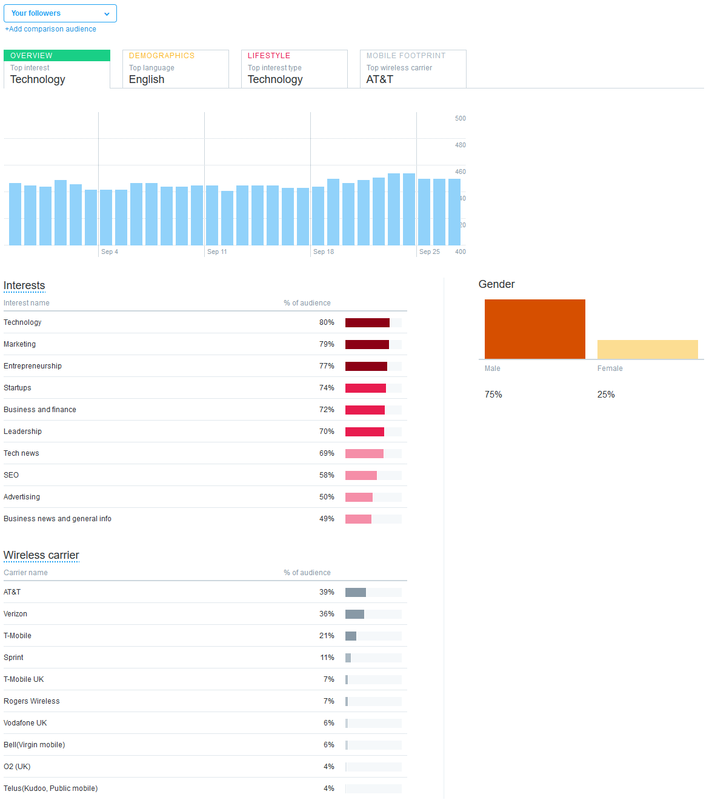 Learn the gender, language, and interests of your Twitter audience. This data only covers Twitter followers. It does not represent any traffic to your website or any of your sales. Now we’re getting to some really good stuff. Now, we’re looking directly at the age and gender breakdown of actual website visitors. See how your website visitors breakdown across affinity, market, and other interests. Question #2: What do your customers care about? You can also think of this as “what problems do your customers have?” What makes them hurt? Even if they don’t know what their pain is you need to know. It’s been said by others that people spend money for just two reasons: pain and pleasure. For your marketing purposes, you might not need to think about it beyond that. For a better understanding of human motivation, we should think about it a bit more. Pain and pleasure viewed as separate motivations may be a distinction without a difference. In both cases, the goal is to attain a more pleasurable state. Either by pursuing pleasure directly or through removing a source of pain, the person is looking to feel better. As descriptive terminology, pain and pleasure also leave something to be desired. Two better candidates are fear and desire. You need to be able to describe what your customer cares about in just a few words at the most. If you can do this already, then great. You can skip to #3! For everyone else, read on. In order to get to the root of what your customer cares about, you’ll need to become a world-class conversationalist. Rule number one for getting to world-class status in conversation is: ask questions. Rule number two is: listen to the answers. Bonus: This works really well with everyone in your life. If you care about someone, then ask them questions and listen to the answers. That’s how you learn more about them. It’s amazing how often this simple approach is overlooked. So you’re already pretty motivated to listen. But what questions should you be asking? The answer is surprisingly simple. Start with the general and move toward the specific. Q: So tell me about x.
X could literally be anything. If this is a lead, then x might be the reason for the call. If it’s a regular customer, then x could be something you already know about. If this is a conversation at an event or party, then x might be “business” or something else just as general. Q: Really, what’s going wrong (or right)? Dig deeper but don’t rush it. This is a conversation, not court testimony. Now you might be getting somewhere. Dig some more and start zeroing in on the real issue. It’s almost never the case that the real cause for concern will be the first thing we talk about. For lots of reasons we usually need to be lured into revealing what really bothers us. A lot of the time we might not consciously know the real cause. Don’t expect anything different from your customers. Question #3: What problem do you solve for them? Don’t think in simple terms about what you can sell to your customers. Instead, think about what problems you can solve for them. Now that you know something about who your past customers have been and what they care about, you need to start solving their problems. Find ways to scratch your customers’ itches and they’ll keep coming back for more. One key to this is to focus on the must have instead of the nice to have. If you want to get really good at this then you’ll have to put in the work. Carefully consider for a long time what your customers really need. You might find that there are already some solutions to these problems on the market. What would they look like if they were better? Then make that! Question #4: What is your Unique Value Proposition (UVP)? This is going to be a combination of your customer demographic, what they care about, and how you help them. A unique value proposition should be boiled down into a single sentence. It will be a clear statement that explains how you will solve that problem you identified. Maybe you solve the problems faster, or more completely, or without the unintended consequences. You can think of your UVP as a why us proposition. Why should anyone buy from you instead of your competitors? If your product is already tuned into your customers’ problem, then make sure your copywriting is pulling its weight. Your copy needs to clearly present your product as the solution to the problem. Write your UVP and test it. Tune it up and test it again until it resonates with your customers. Steve Blanks’ XYZ format is a no nonsense format to write your first UVP. “We help X do Y by doing Z.” Just fill in the blanks. Question #5: Where can you find more customers? This is the juiciest question on the list. It’s the one everyone usually tries to answer first. Though hopefully by now, you can see why it’s really the one that should be left to the last. A great place to get more customers is from people who you’ve already helped. Don’t be shy. Leave your customers happy and then specifically ask them to talk about you. You can’t just wait for them to maybe pass your name along. Don’t wait. Post coupon offers on Facebook, Twitter, Pinterest or wherever you have followers. Encourage them to share the coupon with their friends. Then check to see who shared your coupon! Reward those people with something special! Take your demographic data and make a list of where your customers hang out online. What communities do they like? What are their other interests? Be there. Be there personally and be there with your paid ads. There are a lot of specific tactics that help put you in front of potential customers. Make sure your SEO is as good as it can be. Who can argue with traffic coming in from search? Market on Facebook. Install the Facebook Pixel on your site and create a list of everyone who’s been a visitor. Use the demographic details of this list to create a new audience. This audience will be filled with people that haven’t been to your site but would still probably like it!